I gave a fun (and useful?) lightning talk at Startupfest Montreal 2016, and Ignite Seattle, and a full-length version at the O’Reilly Design Conference, entitled Guaranteed Successful Design. I hope you find it useful and/or entertaining. Here’s the slide deck with notes and 5 minute video from Ignite Seattle. Here’s the full-length slide deck and 45 minute video from the O’Reilly Design Conference 2017. I’ll be speaking at Strata NY next week. My main talk is Designing Data Visualizations, on Friday the 23rd at 11:30am. I’ll also be presenting at the Visualization Showcase Tuesday evening, and at Ignite Strata Wednesday evening. 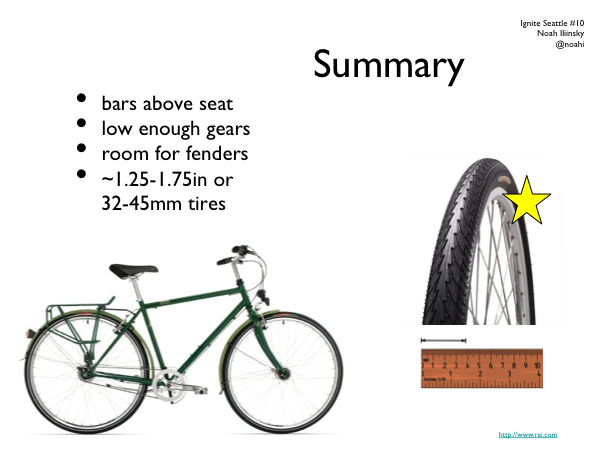 Last summer I gave a talk at Ignite Seattle on how to buy a practical bike. This is the slide deck for that talk. There’s no audio, but you can gather most of it from the images. The summary is below the presentation. In general, when shopping for a bike, the best thing you can do is ride several and find one that sings to you. Details of manufacturer and parts are less relevant if you like how the bike feels when you ride it. At a give price point, most new bikes are going to have a similar mix and quality level of parts. Look for a bike where you can get the handlebar at or above the height of the seat when the seat is adjusted to your leg length. Low gears are critical if you live near hills or plan on carrying or pulling loads. You probably want at least 32mm / 1.25″ wide tires. You don’t need a suspension, or knobby offroad tires, or any tread at all, in the city. Your frame should have room for fenders (you can wait until September for those, but shops may install them free if you buy with your new bike). This Tuesday, February 19th, I’ll be one of several presenters at Ignite Seattle. Come if you can; it will be a good time.